Crew of 2 are self contained. 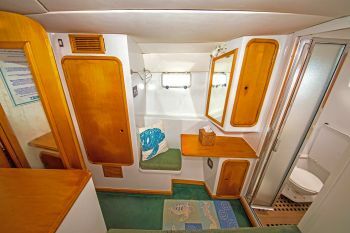 We offer the 57′ Simonis catamaran QUEST because of her delightful new owner operators and diving program, but the yacht needs new carpets and a bit of work. That said, the yacht has hugh potential, and the new, young owner-operators are tons of fun! And delightful to be around! 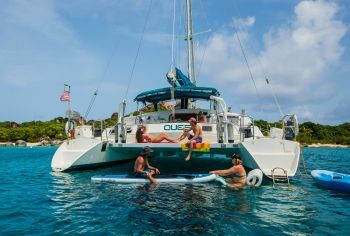 The new young owner operators of the 57′ Simonis catamaran QUEST are into scuba diving and sailing. 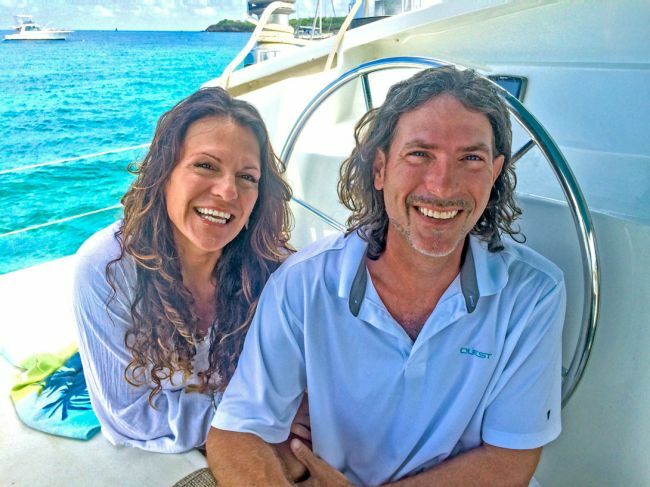 Chris Brizzolara loves to sail! 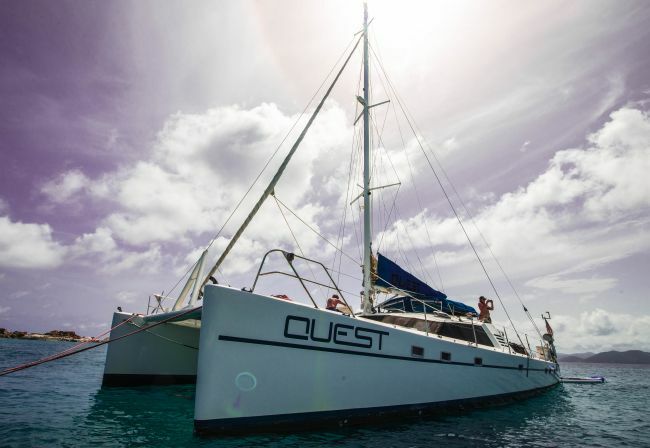 “Give me a gale!” Quest is light and sporty and performs beautifully under sail. 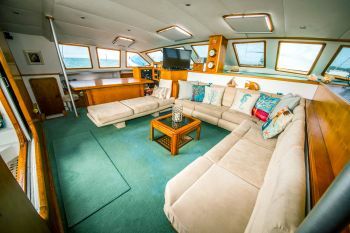 The wide ‘sidewalks’ around the coach roof on deck provide plenty of space for scuba tanks, and diving is why Chris and Nikki bought the boat. They are diving enthusiasts! 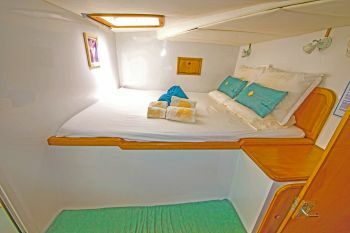 They look forward to introducing guests to the diving and sailing life. 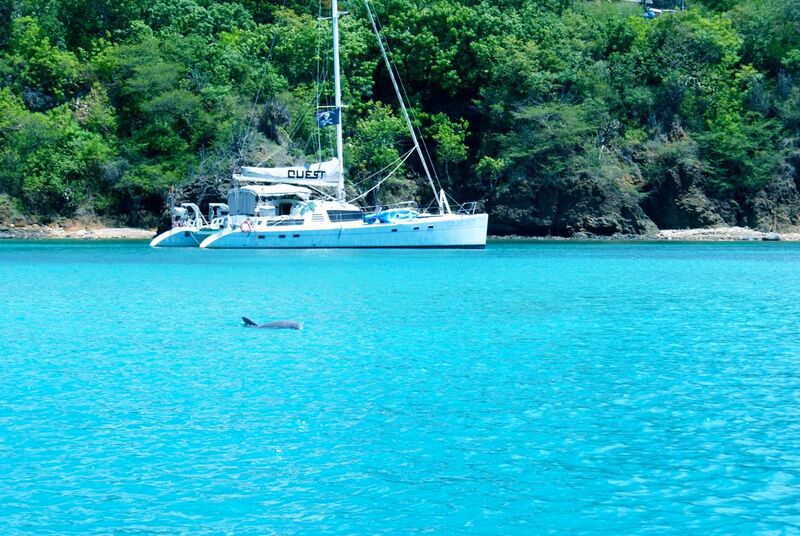 Chris, a dive master, lived in Tortola for 2 years and knows where all the off-the-beaten track hiking trails are. He also enjoys the history of the islands and shares his knowledge with guests. 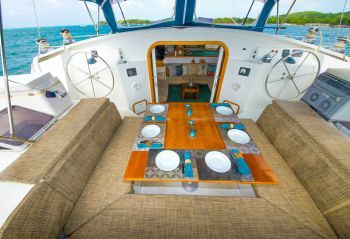 Quests beamy saloon has no dining table or galley in it, so it is wholly dedicated to guests’ comfort. Meals are served in the cockpit. 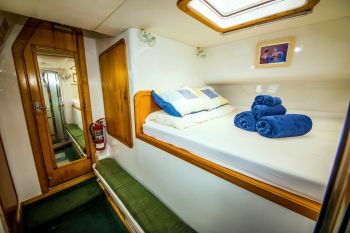 The yacht sleeps six guests in 3 equal Queen cabins, each with private bathroom with automatic flusing heads. 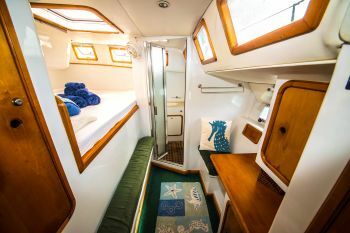 Scuba diving is included in the charter fee, but guests rent gear. 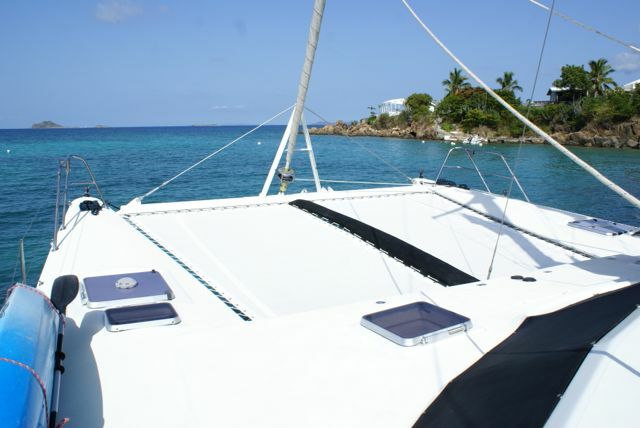 The yacht is flexible to pick up guests in either St. Thomas, Tortola, or St. Croix year round. SCUBA: Diving for certified divers is $150 for 5 dives total. More diving available for the enthusiast, simply inquire ahead of time. If gear is required, please let us know so we can accommodate the correct sizes.